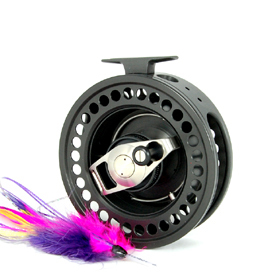 Ulti Mode - the Combination Reel with the Large Arbor -design and with the "Super Quick Change" spool. 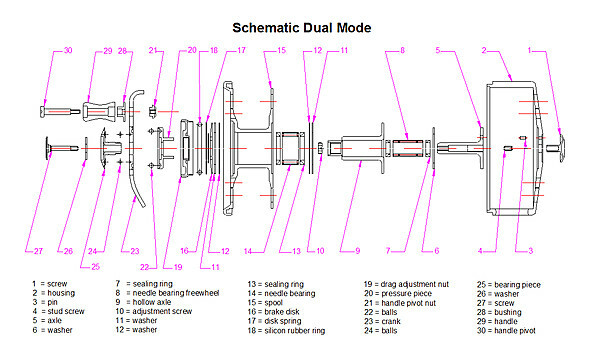 The difference: the respective sizes of the Ulti Mode reel directly corresponds to the line capacity of the like numbered Dual Mode reels. The inner spool diameter of the Ulti Mode corresponds directly to the outside spool diameter of the correspondingly numbered Dual Mode reel. 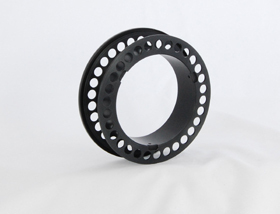 Since the entire volume of the line and backing are shifted to a larger diameter, the Ulti Mode is a true Large Arbor reel. 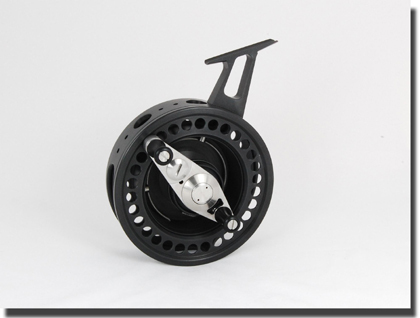 The spool width in each size of the Ulti Mode reels is the same size as the corresponding numbered Dual Mode reels. By retaining the spool width, Henschel reels has diminished the problem of "line caking", or one-sided stacking of line on the spool which can cause problems in a wider Large Arbor spool. Line caking, on-sided stacking of line is the stacking of retrieved line into a hill on the spool. This can "bury" the line on the spool. A buried line over-laps the line being pulled from the spool it can suddenly stop the line being pulled from the spool. The Ulti Mode reels also has a new spool design - the "snap-spool". While the mechanics of the reel are housed in the spool of the Dual Mode reels, the mechanics of the Ulti Mode reel are housed in the frame of the spool. The new design makes changing the spool a "snap". The spool on the reel is "snapped" out and the new spool is "snapped in. No tools or parts to misplace or loose. The spool is held in place by spring loaded parts that eliminate the possibility of a spool becoming a problem while fighting a fish. Lastly, the new spool are much less expensive that the Dual Mode spools. In summary, the Ulti Mode reels are designed for the fisherman who prefers the Large Arbor design and/or the fisherman who changes lines(spools) often. 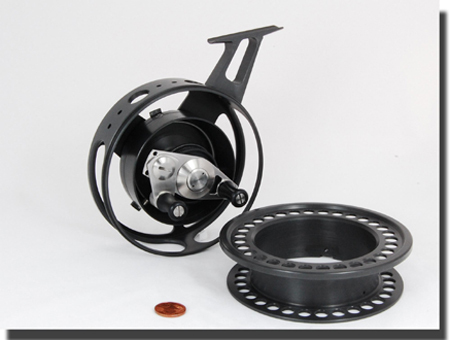 Big Advantage: Henschel Reels has designed the frame for the ULTI Mode reel that allows the reel foot to be connected to the spool in one of three locations. The choice of which location the reel foot is attached to the reel determines where the bar on the spool is located when the reel is attached to the rod. Location #3: attaches the reel foot a small amount to the left position. This position eliminates the possibility of tangling the fly line with the handle, however you have to pull the line only in the direction of the rod. The fisherman can order the ULTI Mode reel with the bar in one of the three positions. New Option is a "Power & Speed" handle for the Ulti Mode #4 reel. Since its introduction in 2003, the Ulti Mode by Henschel® has enjoyed an increasing popularity. Especially by fisherman who have their eyes on big, fast powerful fishes. 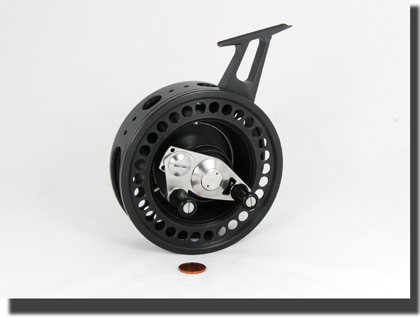 The big advantage of this true large arbor reel is its really big line radius, as well as its fast and simple spool change. In extreme situations, fighting the giants of the blue water can be a problem.The mechanics of these reels high retrieve speed is its biggest advantage, but at times when fish go deep one must use increased force to turn the handle. Everyone who has driven a bicycle with different gears knows the principle. In 2002 the Power & Speed by Henschel® reel was introduced to overcome these problems. Now, with this new optional handle the fisherman is now in the convenient situation to use a long handle which provides full power when retrieving fish or a short handle which allows for a wrist retrieve for picking up line quickly. The short handle has a radius of 1.12 inches and the long handle has a radius of 2.2 inches. fishing for salmon, steelhead, pike and for the saltwater fishing for bonito, striper, dorado a.s.o..